KFC wants you to die slowly and in great pain. This sandwich wants to kill you...slowly and painfully. Here is the proof of how the fast food industry loves to keep America fat and cardiologists employed. 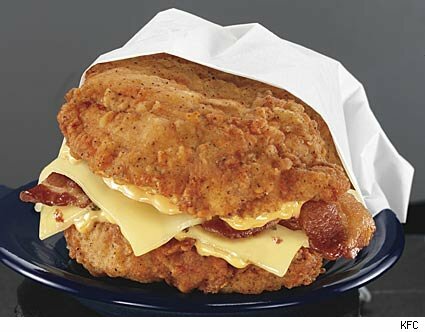 Gaze upon the unholy mess that is the Kentucky Fried Chicken Double Down Sandwich. It is two chicken fillets, bacon, Pepper Jack and Swiss cheese and some goo called “the Colonel’s sauce.” Eat one or two of these belly busters and you’re going to see the Colonel personally. Bread? We don’t got to give you no stinking bread. The chicken fillets are the buns. The Doubled Over is currently being experimented—test marketed—on the poor sapiens of Providence, R.I. and Omaha, Nebraska. No word on what this suicide sandwich costs, but the numbers that do count are 590 calories, 31 grams of fat, 190 mg of cholesterol and a unknown amount of sodium, but between all that breading, bacon, cheese and secret Colonel sauce, you’ve got to think you can put away the salt shaker. Given a choice between slamming down a Double Down and hugging a Al Qaeda suicide vest bomber, I’d go with hugging it out. There’s only a blinding moment of pain and then the end compared to a slow, agonizing death by congestive heart failure. But hell, why stop with two pieces of breaded chicken? Any punk can chomp down on a couple pieces of chicken, bacon, cheese (and don’t forget that sauce personally squeezed out by The Colonel himself)! We’re a big country (and getting bigger all the time) and we like our food big. So what about a Quadruple Down sandwich? You don't eat it. It eats you. Aw yeah, baby! That’s what’s daddy is talkin’ about! Why settle for a double bypass when you can have a quadruple bypass? Can a brutha get that with some extra Colonel sauce? Oh, and a large diet drink? Here is proof that America can’t cook.